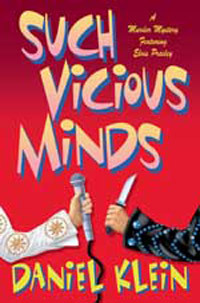 Publication of the fourth instalment in Daniel Klein's great Elvis Presley super-sleuth series, Such Vicious Minds, has been delayed until August 7. It's Memphis, 1965. An increasingly withdrawn Elvis passes his evenings at the Memphian movie house, endlessly watching Stanley Kubrick's "Dr. Stranglelove." His friends and hangers-on are starting to worry, and so is his famously hucksterish manager, Colonel Tom Parker. Things only get worse when the King finds out that someone has been disguising himself as Elvis in order to seduce his teenage fans, and that Colonel Tom's been paying off their parents to keep the scandal out of the press. When a photographer who claims to have documented these seductions is murdered ... and Colonel Tom is arrested for that murder ... the stakes becomes life and death."